Brushstrokes Community Project today announced its involvement in a new national coalition seeking to transform the support offered to people seeking asylum. Brushstrokes, a partnership project of Father Hudson’s Care, the Infant Jesus Sisters and the Parish of St Philip Neri, reaches out to refugees, asylum seekers and the hidden poor in and around Sandwell. The Early Action coalition came together to end what members see as ’fire-fighting’. They aim to move towards a preventative approach that will stop people from reaching crisis points like destitution and ill-health. 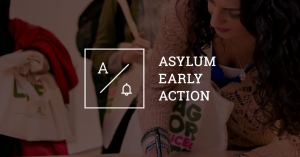 The coalition, which currently consists of eight organisations from across the United Kingdom, argues that people seeking asylum are often forced into poverty because they are not given support early in the application process or given timely advice on where to access support. 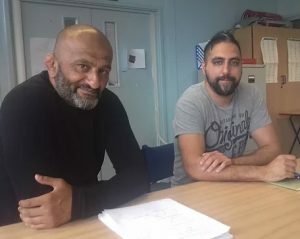 Taking its name from the words of Blessed Nicholas Barré, ‘We must be in the hand of God like a brush in the hand of the painter’, Brushstrokes supports over 800 asylum seekers and refugees in the Black Country and West Birmingham. The project is looking to prioritise its outreach work and immigration advice. David Newall, Brushstrokes project manager, said: “Our outreach service enables us to reach people affected by health issues, lack of childcare and geographical distance. 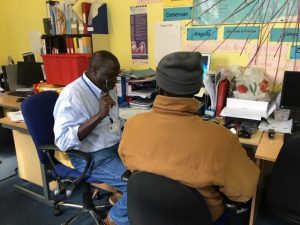 It allows our staff and volunteer team to engage with people much earlier on in their asylum journey, identifying issues early and preventing them from getting worse. Lora Evans, Early Action Charter project manager at Refugee Action, the national charity co-ordinating the coalition, said: “The organisations and charities we are working with do amazing work supporting people seeking asylum but too often they find themselves doing that work in the heat of a crisis. They’re trying to find accommodation and welfare support for people close to starving or who have gone days without urgently needed medical treatment. By working together, the organisations hope to see fewer people needing crisis support and bring about lasting change in the sector. Brushstrokes Community Project is a partnership project between Father Hudson’s Care, the Infant Jesus Sisters and the Parish of St Philip Neri. It provides practical support, advice services and education for people living in extreme poverty. For more information, visit www.brushstrokessandwell.org.uk. This entry was posted in Asylum, Brushstrokes by Caritas. Bookmark the permalink. Copyright © 2019 Caritas: Archdiocese of Birmingham All Rights Reserved.